Christmas, 1865. The fighting was over, the armies disbanded and all over the nation men were returning to hearth and home. When the war began the country was an agrarian republic; by war’s end the nation was an industrial giant beginning to flex its might, bound together from coast to coast by a band of steel rails. While most still lived on farms at war’s end, changes were already in the air. Our Women and the War depicts scenes of women’s participation in public unheard of before the war. “Home from the War” by Winslow Homer illustrates the joyous return to family by northern troops. Women, bereft of their husbands, brothers and fathers had become use to fending for themselves; now their men-folk were back by their sides and all hoped things would return to normal. While no one realized it yet, society had been fundamentally altered by the war. Soldiers returned home to warm welcomes from family and friends. Those who were maimed—those who won their ‘red badge’—were celebrated as heroes. But many who came home whole had wounds as well, invisible wounds. Many wives welcomed their husbands back to their side, only find themselves sleeping next to a stranger. Today we have a name for it—PTSD—but back then it was just attributed to “the war” and men and women simply made do and got on with their lives. 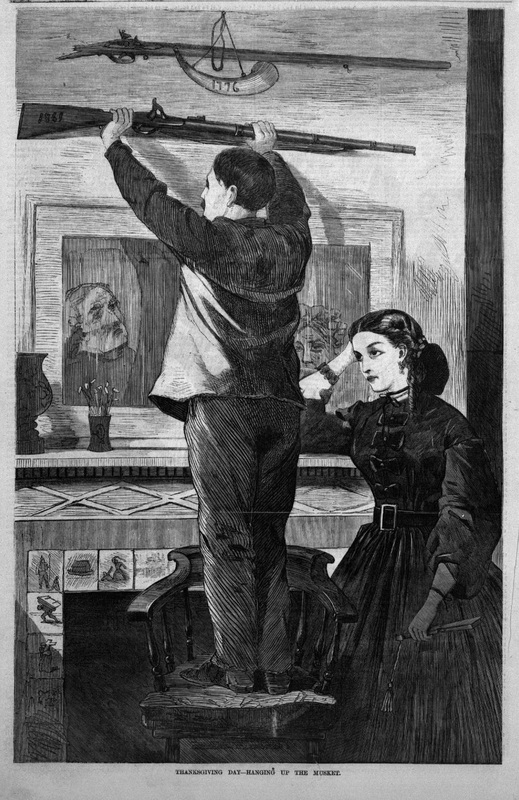 “Hanging up the Musket,” by Winslow Homer shows a veteran hanging up his gun while his wife has a curious expression on her face. Winslow Homer, whose evocative art captured camp life during the war, captured something of this new domestic reality in his artwork. Still, all told, Christmas of 1865 in the North was indeed a joyous time: the nation was reunited and at peace. 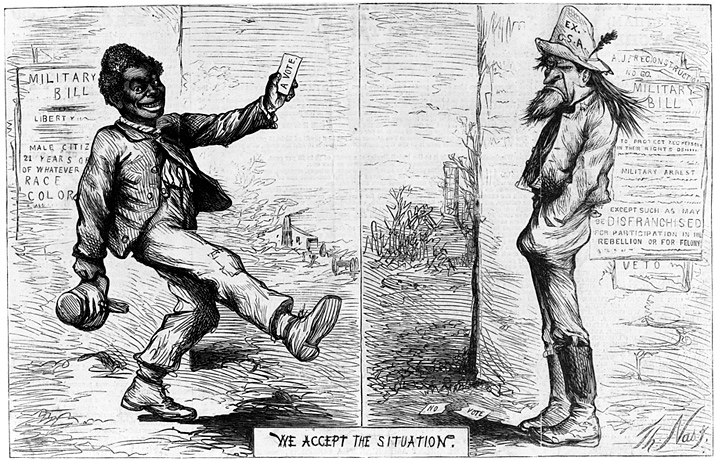 Moreover, only a week before Christmas Secretary State Seward announced with the passage of the 13th Amendment to the Constitution, officially doing away with slavery. 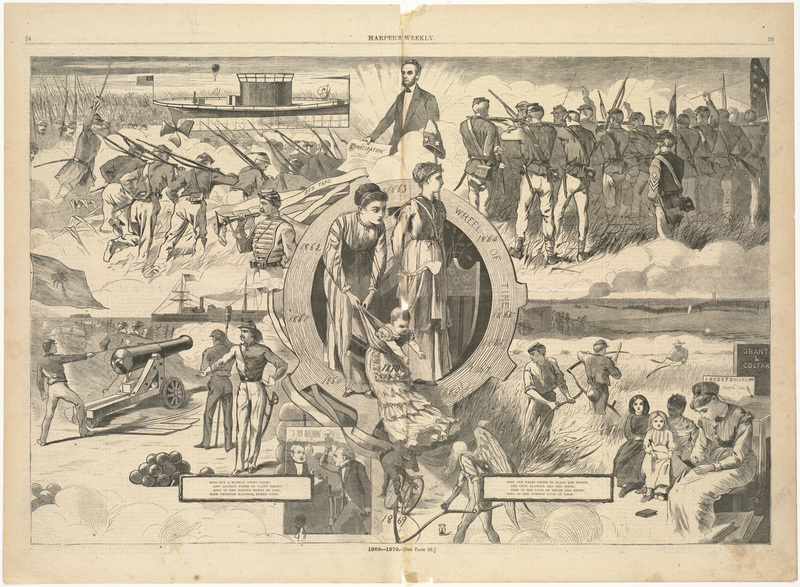 On December 18, the words of the new amendment at last became the law of the land: “neither slavery nor involuntary servitude, except as a punishment for crime whereof the party shall have been duly convicted, shall exist within the United States, or any place subject to their jurisdiction.” Slavery was at last abolished; the Union victory was complete. 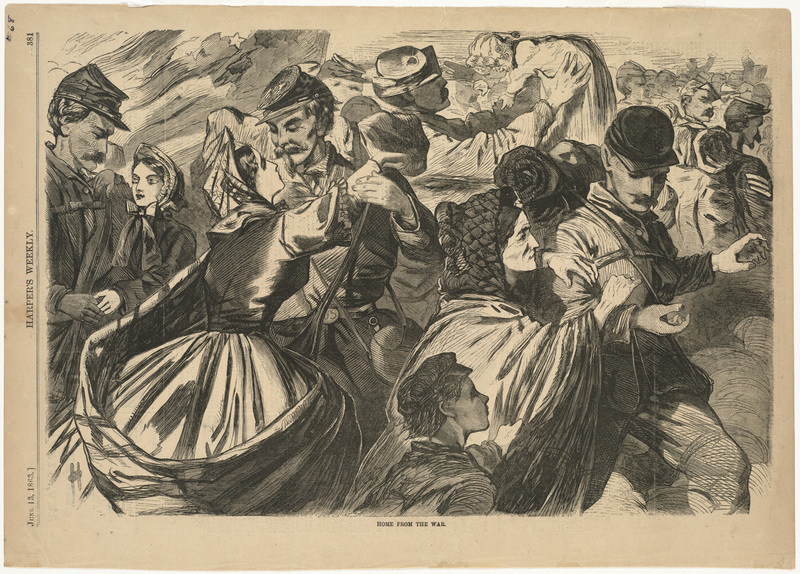 A terrible winter storm struck the east coast just before Christmas that claimed the lives of many aboard ships at sea, but Christmas Day itself dawned bright and clear in New York City, although the rain melted the snow and ice of the previous days, spoiling the usual skating parties in Central Park. Although the Christmas cover of Harper’s had a religious theme for a change, Thomas Nast still weighed in with his usual centerfold celebrating both Christmas and the Union victory. Although most of the tableau celebrates the new peace, down at the bottom General Grant stands center stage with the heads of Jefferson Davis, General Lee and other Rebel leaders at his feet. The caption in part reads: “For the heroic dead, the flower of our youth which the fierce war withered, there will be forever renewed tenderness of private remembrance and of public respect with every Christmas season. For most Americans in the North, Christmas was a time of plenty and celebration, food was abundant on every table and scarcely anyone had cause for complaint. In the South, however, the situation was far different. Peace had come to the land and for the most part the soldiers were home with their loved ones—if they still had homes to live in. But throughout the South, many cities were still in ruins: Atlanta, Charleston, Columbia and Selma; the work of rebuilding and recovery had just begun. Many parts of the countryside, moreover, had also been ravaged by the passage of armies. Far more so than in the North, there were many families where the man of the household would never be returning; food was scarce and many who had known plenty before the war, now faced want and deprivation. 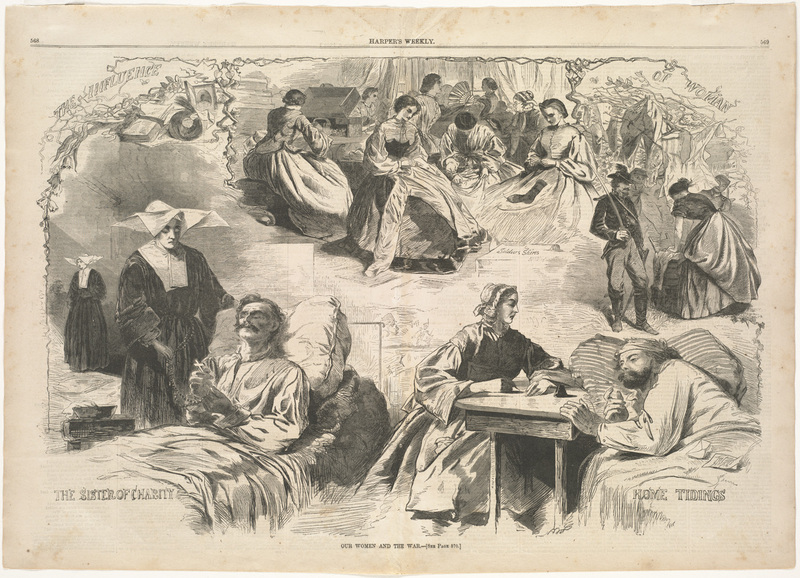 Even where there was adequate shelter and food, and loved ones had made it safely home again, the bitter gall of defeat left a pall over the holiday season. 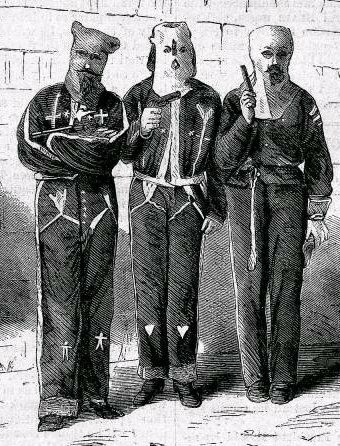 Early Klansmen, arrested for violence. More often than not they escaped justice. Christmas Eve, December 24, 1865 marked one notable anniversary in the South, however. On that date eight former Confederate soldiers gathered in Pulaski, Tennessee to form a new fraternal organization. As former Rebels they were prohibited by law from working in business, so they decided to while away their idle hours in social merriment, with secret handshakes, signs and other occult activities know only to the members of their circle—or kuklos. Although initially organized more from boredom than animosity, the night-time rides of their Kuklos—their Klu Klux Klan—lubricated by large quantities of liquor, soon turned more sinister and more violent. 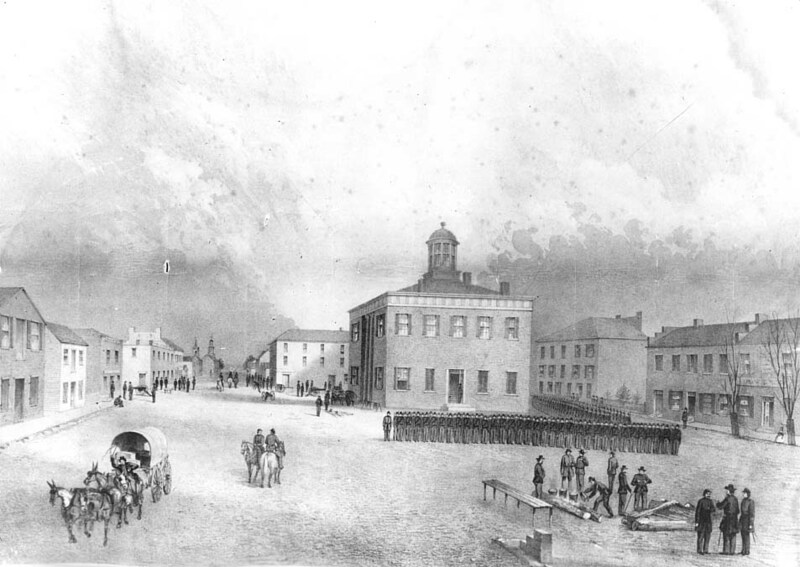 In many parts of the South, civil government had virtually ceased to exist and the isolated Federal garrisons were resented as an occupying army. Life and property were defended by knife and gun and wartime scores were evened in the same manner. Vendetta and vigilantism soon became the order of the day in many parts of the South. Added to that was the fact that, in the deep South, the cotton farmers had been forced to sell their last cotton harvest to the Confederate government in return for virtually worthless Confederate paper money. With the collapse of government, many farmers hid their bales of cotton in hopes of somehow getting it to market either in the North or in England, where cotton was going for record prices. Meanwhile, close behind the Union troops had come a small army of Treasury Agents who were paid on commission for every bale of Confederate cotton they seized. Corruption was rife among the Federal agents who pocketed much of the profits for themselves. While Southern planters were primarily interested in their making money back on their valuable cotton, killing a Federal agent or two in the process was more or less a bonus. Peace was restored, but in the South it was a fragile peace where Christmas and goodwill to fellow men was in short supply. The process of healing would a long one. It is still not complete. Christmas in 1865 was a joyous affair, to be sure, but for many it was a bittersweet joy. 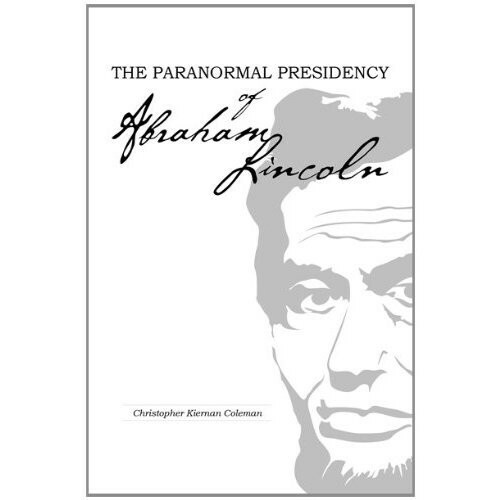 For more true accounts of less publicized aspects of the Civil War, read Ghosts and Haunts of the Civil War and The Paranormal Presidency of Abraham Lincoln. Coming in mid-2016 will be Ambrose Bierce and the Period of Honorable Strife, chronicling American author Ambrose Bierce’s wartime experiences with the Army of the Cumberland. 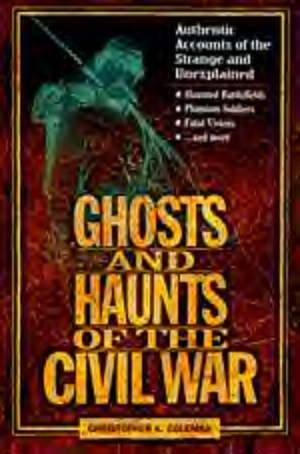 Ghosts and Haunts of the Civil War (HarperCollins). Advance picket guard keeping watch against surprise attack. December 25, 1861. A nineteen year old private in the Confederate army, Valerius Cincinnatus Giles, was on guard detail along the Potomac River this Winter day, pacing back and forth and occasionally staring over at the Yankees of General Sickles’ New York Brigade on the Maryland side. Private Giles of the 4th Texas was on picket duty on December 21, 1861, when he had an uncanny encounter. 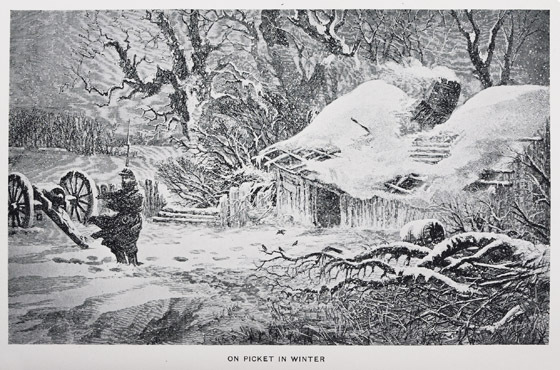 As a picket, his duty was give the alarm of any enemy activity, lest the vile Yankees should decide to leave the comfort of their warm huts and brave the bleak cold outside. Private Giles’ unit, a detachment of the 4th Texas Infantry, had just relieved another unit guarding that sector. The men would rather have been back in camp, enjoying the holiday as best they could; but duty called, and someone needed to be on duty, no matter what. Private Giles and his two brothers had all answered the call of duty and volunteered for the Confederate army. Giles, still smartly dressed in his long grey frock coat with black waist belt and black strap over his right shoulder, and adorned with a black Hardee hat with one side turned up, looked the model of a military man. One of Giles’s brothers was serving with the Tenth Texas Infantry in Arkansas, while the other, brother Lew, was with Terry’s Rangers (Eighth Texas Cavalry), somewhere in Kentucky. There was little likelihood of Valerius being in any personal danger that Christmas; the Yankees desired a break from war that day as much as the Rebels. That afternoon there was a brief to-do when a Yankee steamboat came in sight. But it was soon recognized as a hospital ship and not a gunboat, and so was left alone to ply it trade on the opposite shore. More out of boredom than necessity, Private Giles began to walk his post, tramping through snow knee deep in places. The colder clime of northern Virginia was a change of scene for the Texas boy and there in the piney woods in midwinter, when the earth and green branches of the trees were covered with snow, there was no sound of birds singing or crickets chirping. With not a breath of air blowing, the stillness all around him seemed oppressive. Knowing Lew was far away to the west somewhere in either Kentucky or Tennessee, Val thought at first that somehow it was just his homesickness playing on his imagination; that it was some kind of delusion. Yet he knew his brother’s voice and knew that the voice he had heard was his brother’s. Gallatin, Tennessee, where Valerius’ brother Lew was brought after being wounded in Kentucky. It was only later that Val learned that Lew had been wounded at the Battle of Mumfordville, in Kentucky, on the seventeenth of December. Seriously injured, he had been taken to Gallatin, Tennessee, to the home of a family friend, where he lingered for several days. According to information the family later received from their father’s friend in Gallatin, Lew Giles expired at exactly four p.m. on Christmas Day of 1861. 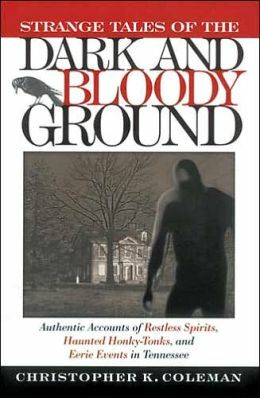 For more true Civil War stories, see: Strange Tales of the Dark and Bloody Ground and Ghosts and Haunts of the Civil War. Now out is my latest Civil War book, Ambrose Bierce and the Period of Honorable Strife. Ambrose Bierce is famed as a noted American writer, satirist and cynic. Less well known is Bierce’s military career during the Civil War, where he fought with distinction in many of the major battles of the war. Ambrose Bierce and the Period of Honorable Strife chronicles his wartime experiences in depth for the first time. Ghosts and Haunts of the Civil War, uncanny tales of the Civil War.